The experimental data for the reaction: 2A + B2 → 2AB is: Write the rate equation for the reaction? The rate constant for a reaction of zero order in A is 0.0030 mol L-1 s-1. How long will it take for the initial concentration of A to fall from 0.10 M to 0.075 M? Calculate the rate of reaction from the rate law: = k[A] [B]2, when the concentration of A and B are 0.01 M and 0.02 M respectively and k = 5.1 x 10-3 L2 mol-2 s-1. In second order reaction why the graph btwn concentration and rate will be parabola and why it will be starting from origin and will open upwards? An optically active compound 'A' upon acid catalysed hydrolysis yield two optically active compounds 'B' and 'C' by pseudo first order kinetics. The observed rotation of the mixture after 20 minutes was 5 degrees and after completion of reaction was -20 degrees. If optical rotation per mole of A, B and C are 60, 40 and -80 degrees. Calculate half life of the reaction. The decomposition of Cl2O7 at 400K in gas phase to Cl2 and O2 is a first order reaction. (ii) Calculate the pressure of Cl2O7 after 100s of decomposition at this temperature. What is a first order reaction ? the hydrolysis of ester was carriecout separately with0.05M HCl and 0.05M H2SO4.which one of the following is true and why? A first order reaction has a rate constant of 0.0051 min-1. If we begin with 0.10 M concentration of the reactant, what concentration of the reactant will be left after 3 hours? What is meant by the 'rate constant, k' of a reaction? If the concentration be expressed in mol L-1 units and time in seconds, what would be the units for k (i) for a zero order reaction and (ii) for a first order reaction? A first order decomposition reaction takes 40 minutes for 30% decomposition. Calculate its t1/2 value. The rate of reaction between A and B increases by a factor of 100. Calculate the order of the reaction when the concentration of A is increased 10 times. The half-life of a first order decomposition of nitramide is 2.1 hour at 25o C. Determine the time taken for the compound to decompose 99% of its original amount, rate constant = 0.2303 per hour. The reaction A + 3B 2C obeys the rate equation: Rate = k[A]1/3 [B]3/2. Find out the order of this reaction? A gas phase decomposition of xy follows the rate law r = k[xy]n. what are the units of its rate constant? Explain why the rate of a chemical reaction does not remain uniform throughout the reaction? where x is the decrease in partial pressure of A and increase in partial pressure of B&C. 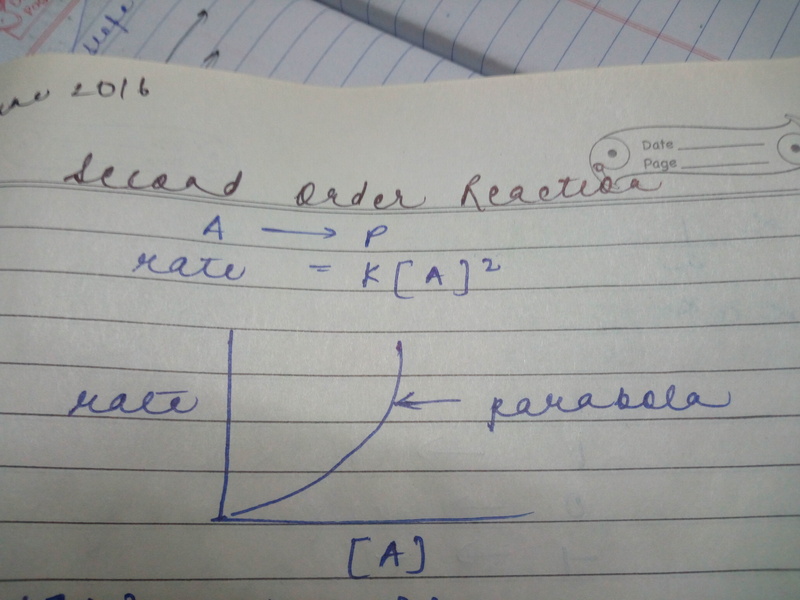 Draw schematic graphs showing the following details of the first order reactions.i) Variation of the rate of reaction with change in the concentration of the reactant. ii) Variation of In [R] Vs t and Log [Ro]/[R] vs t.
For a chemical reaction X Y, The rate increases by the factor 2.25 when concentration of X is increased by 1.5. Derive or suggest the rate law equation and find the order of reaction.